The brake lights and taillights are often one light bulb but they work differently. Taillights are necessary for night time driving. They are in their place so other drivers can spot you from behind and so that they can brake at a safe distance from you if you stop. 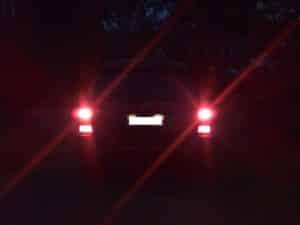 Driving at night without brake lights or tail lights can thus be extremely dangerous. The problem is that you cannot tell if your taillights and brake lights are faulty. They are situated in the back of the car which makes them hard to notice. It will not be unless someone brings your attention to them that you will notice there is some fault. The absence of taillights or brake lights can lead to severe accidents especially if it is raining at night or fog is present on the roads. The police would also give you a ticket if you are reckless. Therefore, it is necessary for both your taillights and brake lights to work. But sometimes it happens that one of them works and the other doesn’t. Why is that? We will find out below that there are a few reasons that this can happen. Your vehicle’s taillights are working fine but when you press the brakes the brake lights don’t come on. This is a strange problem since essentially the connections for both lights come from the same source. Either one light shines more than the other or the taillights completely switch off when you press the brakes. New cars do often use LED lights for the taillights. But if you have an older car you want to check the light bulbs. A blown or fused bulb is the most basic reason behind a faulty brake light. If the bulb used in the brake light has gone faulty it will not work when you depress the brakes. This way your taillight will work but when you brake, your brake lights won’t work. You can check and solve this problem by opening your car’s trunk and removing the taillights back cover. Undo the cover using a set of screwdrivers and remove the bulb by pressing and turning then check to see if it has blown out. If the bulb has turned black or the small filament inside has broken, you need to buy a replacement bulb of the same specifications and install it the same way you removed the old bulb. Sometimes the same bulb is used for the taillight and the brake light. If that is the case then there is some other problem haunting you. That leads us to the second reason why you could end up in this situation. All electronic equipment in a car is supplied electricity through wires that go through a fuse box. Modern cars have two fuse boxes. There is one below the dashboard and there is one under the hood. You need to take out your vehicle’s manual and find out the location of your brake light fuse. There is a high chance that due to an electrical surge, the brake light fuse has blown off. Identify the correct fuse and replace it with a similar one. This should make your brake lights work perfectly again. While you are at it, you should find the source of the problem and fix it or the fuse will keep blowing from time to time. The alternator is the first place to look. If the brake light switch is working fine, there might be an issue with the ground wiring. The ground is necessary for the electrical components to work. You have to find the ground wire or the ground switch, in some cases, and check if it is dilapidated. If it is, you need to make a new ground for your brake light. If the brake light now works fine, you have solved your problem. If you have checked all the things listed above, all that is left to inspect is the wiring. It is possible that rodents have nibbled away at the wiring inside your car or that the wiring has deteriorated over time. Check all the connections and make sure everything has been tied together properly. Corrosion is also a leading reason why the wiring becomes faulty. Over time, moisture from rain and snow seeps into small places where the wiring and the fuse box is located. This moisture can give birth to rust which can disrupt the entire electronic circuit. 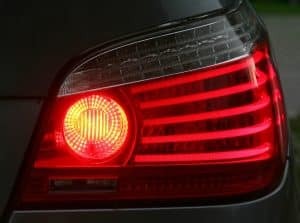 In some vehicles, the brake light switch is powered through a single circuit that also includes the turn signal light. If the turn signal switch is not working properly, your brake light can also not work. Find the wire that connects the brake light and the turn signal switch and replace it. Chances are that this action would solve your problem. If not, then you have no other choice but to visit a mechanic or an electrician. Since there are a lot of reasons for the brake light to fail while the taillight is working, it is difficult for an average person to decide which is the source problem. In such cases, it is always best to consult the vehicle’s user manual or, if you have some money to spare, a mechanic. You might have sparse knowledge on electronics and rather than solving the problem you could elevate it. A mechanic, on the other hand, is qualified to do such jobs. Mechanics also have the proper equipment to test and solve your brake light issue. However, they charge money for their services. In general, an electrician or mechanic would charge you $100 or more just for finding out the issue. Then to rectify the problem, you would have to pay more for the parts. Anyways spending some money here is better than paying a hefty fine in the future.